Lulworth Cove is a cove near the village of West Lulworth, on the Jurassic Coast in Dorset, southern England. The cove is one of the world's finest examples of such a landform, and is a World Heritage Site and tourist location with approximately 500,000 visitors every year, of whom about 30 percent visit in July and August. It is close to the rock arch of Durdle Door and other Jurassic Coast sites. The cove has formed as a result of bands of rock of alternating geological resistance running parallel to the coastline (a concordant coastline). On the seaward side the clays and sands have been eroded away. A narrow—less than 30 metres (98 ft)—band of Portland limestone rocks forms the shoreline. Behind this is a narrow—less than 50 metres (160 ft)—band of slightly less resistant Purbeck limestone. Behind this are 300 to 500 metres (980 to 1,640 ft) of much less resistant clays and greensands; Wealden clays, Gault and Upper Greensand. Forming the back of the cove is a 250-metre-wide (820 ft) band of chalk, which is considerably more resistant than the clays and sands, but less resistant than the limestones. The entrance to the cove is a narrow gap in the limestone bands, formed by wave action and weathering. The wide part of the cove is where the weak clays and greensands have been eroded. At the back of the cove, the sea has been unable to erode the chalk as fast because chalk does not dissolve in the sea acids. [dubious – discuss] The unique shape of the cove is a result of wave diffraction. The narrow entrance to the cove causes waves to bend into an arced shape, as is visible in the photograph below. Lulworth acts as a staircase to this part of the Jurassic Coast. As well as the cove, across Hambury Tout (the large chalk hill to the west) is Durdle Door, a natural arch. To the east there is a fossilised forest. Lulworth is also close to Kimmeridge, famous for its rocky shore and fossils. Oil-bearing sands beneath the sea bed form the largest British oil field outside the North Sea area, and contain the highest quality oil in Europe. Geologists and geographers have been interested in the area since the beginning of the 19th century, and in the 1830s the first serious study of the area took place. Since then the area has drawn students from all over the world. Purbeck suffers from trampling because of its many visitors and erosion from the sea. Management has been put in place to stop the coastline from being ruined, such as wooden steps and fences. These will keep people to a certain path and steps will reinforce the ground. In 2001, the coast was granted World Heritage Site status by UNESCO. Experts at UNESCO have been working on preserving the shape of Lulworth Cove. 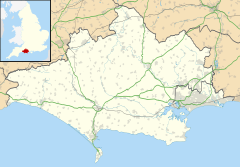 Lulworth was one of a number of gateway villages on the coast with a Heritage Centre—part visitor centre, tourist information and natural history museum—which in 2002 received 418,595 visitors. Most of the area is privately owned by the Lulworth Estate, an estate held by the Welds wealthy landowning family. Land to the east is owned by the Ministry of Defence and used for tank training, only open at weekends and holidays. The coast and land to the north and around the village is owned and managed by the Lulworth Estate (see Lulworth Castle). Each year, over 250,000 people walk across the hill linking the cove to Durdle Door. Stair Hole, less than half a mile to the west, is an infant cove which suggests what Lulworth Cove would have looked like a few hundred thousand years ago. The sea has made a gap in the Portland and Purbeck limestone here, as well as a small arch. The sea has made its way through to the Wealden clays and begun eroding them. The clay shows obvious signs of slumping, and is eroding very rapidly. Stair Hole shows one of the best examples of limestone folding in the world, caused by movements in the Earth's crust tectonics millions of years ago. Folding can also be seen at nearby Durdle Door and at Lulworth cove itself. ^ "The Lulworth Estate". Retrieved 2012-09-29. Wikimedia Commons has media related to Lulworth Cove, Dorset.